AV Dieter Wellmann of Stromberg-Schindeldorf (near Bad Kreuznach, Germany) has submitted a large number of new designs for the Anchor sets. On the left is a tennis arena built with two sets NF 18. OK, that is a lot of stones (2,368), but Dieter has created several new designs for the smallest of the (useful) Anchor sets, NF 6 (105 stones). But the tennis arena deserves another look. Too many people think that Anchor stones are only useful for old fashioned buildings -- churches and castles from the 19th C. That is not true, as Dieter's designs continue to remind us. 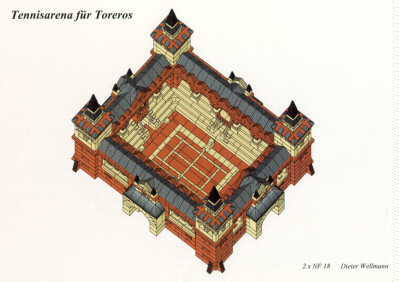 This Spanish style tennis arena looks ready for a clay court competition. Four designs for NF 6 are shown on the builder's page. These and many more designs (NF 6 through 18) are available on the web in the form of PDF files. Of course they are free; all you need to do is to print them out. For those of you who are interested, here is the old picture of me but a new one of one of my cats. My picture was taken last year at my 67 birthday party. All sets (through # 22A) and puzzles are now in stock -- a few were sold out during Christmas. The prices for all of sets and puzzles is found on the new puzzles and sets page. The last CVA meeting was on Saturday, April 23, 2005. The next meeting date will be on October 22, 2005. I hope you will be there; I intend to attend. See the CVA page for details. The Club of Anchor Friends (CVA) has published a Stone Catalog. I brought home two copies. The cost is $35.00, including postage. More may be printed, in that the update has been postponed. To satisfy the demand, the Stone Catalog has been made available on CD in the PDF format. You can download the 10.2M file. This file has also been added to CD # 6, because that CD has the book and other basic reference information. Should you buy the printed version? It all depends on 1) whether you have European A4 paper (required to keep the scale) and 2) how feel about printing almost 200 double sided pages. The amount of additional work to do continues to grow; the discovery of the original molds has added even more work. I saw one mold which was used to make a stone I had never seen -- not even heard of. The new factory has to use it to make one (OK, some). For more information, you can e-mail me if you want one. Remember that the loose leaf format makes it easy to update your catalog. The next update is now scheduled to appear in 2006 or '07. This revision will be a major update, far larger than thought earlier. It will probably be as large as the current catalog! A second binder may be needed. This increase in size is not an indication of errors, but an attempt to get as much information as possible in this catalog. Since the catalog uses a loose leaf format, you will need only the new and changed pages. The amount of detailed information in this catalog is very great, and the information keeps coming in. And it has become clear that e-mails with just numbers of stones in a set just will not do; a photocopy or scan (in color if at all possible) of an actual packing plan is required. My e-mail address is georgeh@ankerstein.org. If I ever change the ISP for the web site -- www.ankerstein.org -- my old 'rlc' e-mail address will change, but my 'ankerstein' e-mail address is (more or less) permanent. For the month of June, 2005.